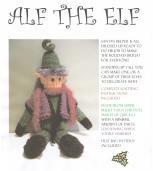 This kit contains all yarn needed to make Santa's helper - green, black, flesh, and TD black super bulky hand dyed yarns,, specialty yarn for the hair, button eyes, wire for the hat and specialty yarn for the scarf. Black alpaca for stuffing feet and hands. Complete knitting and construction instructions included to make this fun project.